I guess I owe you a bit more of an update on what I’m up to these days and what is becoming of the offshoots of Record and Ride. Towards the end of my trip, I started thinking about organising a festival inviting all the people I recorded to come, meet and perform together. We had a few family meetings to discuss how this might happen. The idea slowly got stored away and half forgotten about. In late October last year, as I was walking down a canal path in oxford, I met a distant friend and somehow the idea of organising a festival resurfaced. 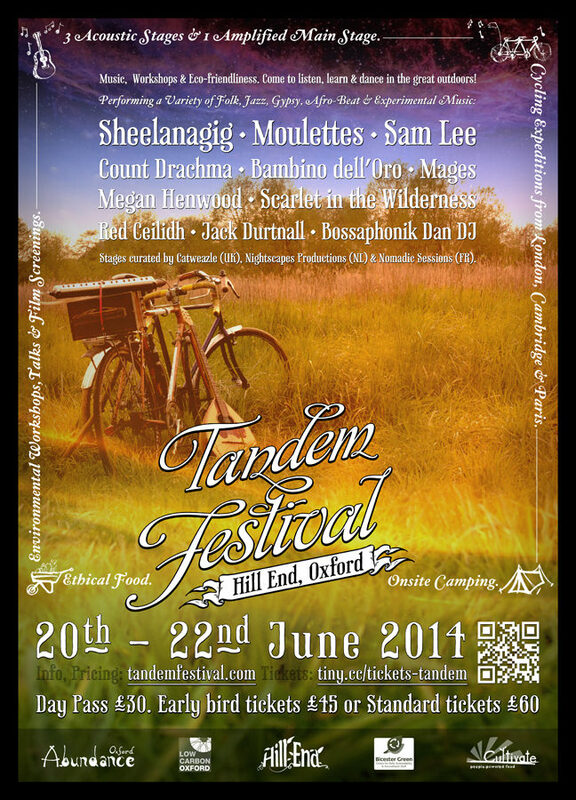 A few months later, we and a great team are organising Tandem Festival ! It’s a three day celebration over the summer solstice – 20th to 22nd June. We’re putting music and environmental sustainability in tandem. We’ll be hosting 3 acoustic stages, 1 amplified one, workshops and talks, in a stunning 63 acres site just outside Oxford. Of course some of the Record and Ride artists will be coming along to perform! You can get more information on our website or by following us on facebook or twitter. Voilà. Here is the poster for the festival and I hope to see some of you there! Record and Ride · A five months trip recording and cycling.